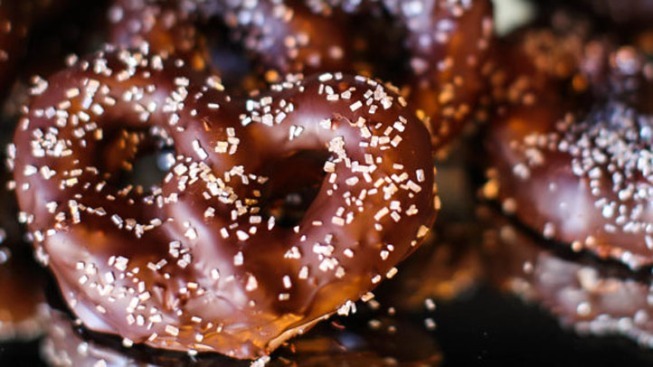 Savannah's Adam Turoni is famous for his whimsical chocolates, like these Colossal Dark Chocolate covered Pretzels. The following content is created in consultation with JetBlue. It does not reflect the work or opinions of NBC New York's editorial staff. To learn more, visit jetblue.com. Savannah and Hilton Head Island are home to some of the South's best dining and cultural experiences. From fresh-caught fish to 20th century art, both destinations offer unique and charming adventures, making them the perfect locations for your next getaway. With JetBlue now offering daily nonstop service from New York (JFK) to the Savannah/Hilton Head Island area, there's never been a better time to start making restaurant reservations and mapping out which museums to explore. Read on for a few of our favorite spots in each destination. No visit to Savannah is complete without visiting Chocolat by Adam Turoni. Skip the savory snacks (as tempting as they might be) and get your sugar fix at this local spot. After studying at the Culinary Institute of America and working at the legendary Chez Panisse, Turoni turned his attention to chocolate. Today, the celebrated chocolatier serves whimsical confections like Mint Julep Truffles, Honeycomb-filled Chocolate Bars and (our favorite) Bacon Butter Pecan Toffee. Spend the afternoon at the Telfair Academy, a neoclassical Regency-style mansion and art museum. Browse the museum's permanent collection, comprised of 19th and 20th century art that's highlighted by works from some of the most noted American Impressionists. And don't forget to meander through the sculpture garden, which graced the book jacket of Midnight in the Garden of Good and Evil by John Berendt. Occupying the old building frame of a former automotive service station, this Historic Downtown hotspot has long been a favorite among the brunch crowd. However, we like it best for dinner, where the quirky, New York City aesthetic pairs perfectly with signature, Southern-style staples like the Bourbon Glazed Chicken or the Grass-Fed Burger (add bleu cheese and bacon and thank us later). For over 40 years, Hudson's on the Docks has been serving the freshest seafood on Hilton Head Island (and, quite possibly, in the world). From the shrimp to the oysters, all seafood is caught locally and prepared from scratch in house. Stop by for an al fresco lunch, where you can enjoy their famous shrimp and grits while admiring fantastic views of the Port Royal Sound. Head over to Hilton Head Island's most iconic landmark for a tour (part of proceeds go to local charities) and to see one of the few female lighthouse keepers in North America, Nadia Wagner. You'll enjoy stunning views, one of the best gift shops in town and—if you time it right—a gorgeous sunset. Open daily from 10 a.m. Explore the natural history and cultural heritage of Lowcountry at this immersive museum. With 68 acres open to the public, the Coastal Discovery Museum ranks as the last significant parcel of open space on the island. The experience includes salt marshes, a heritage garden, nature trails, a collection of the oldest buildings on the island and the state's largest Southern Red Cedar tree, dated back to 1595. Call ahead to book a guided History Walk, or better yet, reserve your spot in an evening Sea Turtle Talk. To start planning your Savannah/Hilton Head Island escape, visit jetblue.com and book your nonstop flight from New York (JFK) today.